Bankso in Bulgaria is the cheapest place in Europe for Brits to go skiing this winter, a new ranking has revealed. 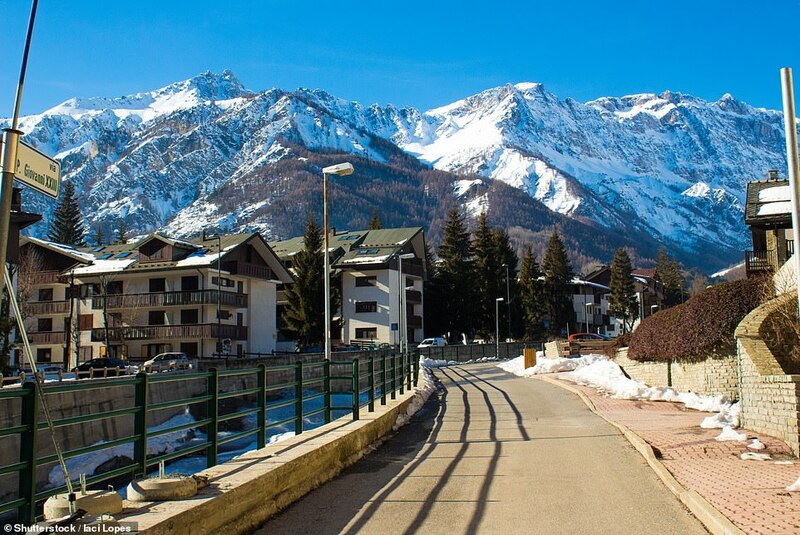 It beat the Italian resort of Bardonecchia, which is named as the second cheapest place to enjoy a getaway on the slopes. And Brits who like skiing in North America might like to consider the Canadian resort of Banff, because that’s where their pound will stretch furthest. The ranking was revealed in the 12th annual Post Office Travel Money ski resort report, which is produced with Crystal Ski Holidays. To compile the list, researchers looked at the prices of ski essentials such as equipment hire, lift pass, ski tuition, lunch on the slopes and a range of drinks. 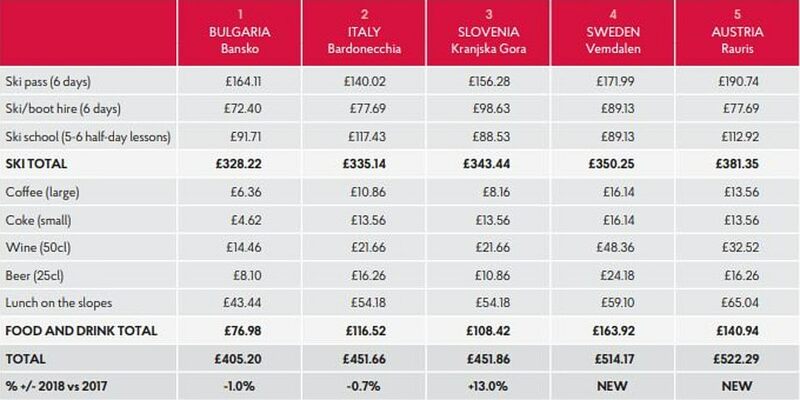 This year’s report revealed that prices have fallen marginally in Bansko to £405.20 and Bardonecchia to £451.66 to help pull them ahead of last year’s cheapest resort of Kranjska Gora in Slovenia. However, Italy is the cheapest country overall, boasting four resorts in the best value top 10. Sestriere is in seventh place (£529) after recording a 1.4 per cent increase in prices compared with last year. Prices in eighth-placed La Thuile (£555) are down 1.9 per cent on last season but Cervinia (10th place at around £606) has seen a rise of 7.5 per cent. By contrast, there are no French ski resorts in this year’s top 10. The cheapest of five surveyed was Morzine (£608) but a 7.6 per cent rise in prices means the resort has fallen two places to 11th in this year’s table. Visitors to Val d’Isère (£884, 22nd in the table) can expect to pay almost 13 per cent more this season, while prices in Courchevel (£855, 20th place) are up 8.9 per cent and they are 8.1 per cent higher in Les Deux Alpes (£656, 17th). However, in Serre Chevalier (15th place) the same ski essentials cost just under £637, only 3.6 per cent more than a year ago. This year’s Post Office Ski Resort Report also features five new European resorts: Garmisch Partenkirchen (Germany), Grindelwald (Switzerland), Rauris (Austria); Trysil (Norway) and Vemdalen (Sweden). Vemdalen (£514) proved to be the cheapest of the five and has taken fourth place in the table ahead of all the Austrian, French and Swiss resorts surveyed. Rauris has emerged as best value of five Austrian resorts and is slightly cheaper than Ellmau at around £522 compared with £527. However, prices in Ellmau have dropped by over four per cent since last year, the biggest fall among the 25 European resorts. By comparison, they have risen 12.7 per cent in St Anton (£922, 24th place), making it 75 per cent pricier than Ellmau. Zermatt again proved to be the most expensive resort surveyed in Europe at £1,026, although prices are down marginally (-0.3 per cent). Interestingly, the cost of living in the Swiss resort is over two-thirds (69 per cent) higher than in Cervinia, across the border in Italy and the only other resort with access to the Matterhorn. New addition Grindelwald (£871) proved to be almost two per cent cheaper than the cost in nearby Wengen last season. In North America, where pricing excludes ski tuition this year, prices in Banff came in at £563 per week. The Canadian resort was 40 per cent cheaper than Vail (£933), again the most expensive in North America. 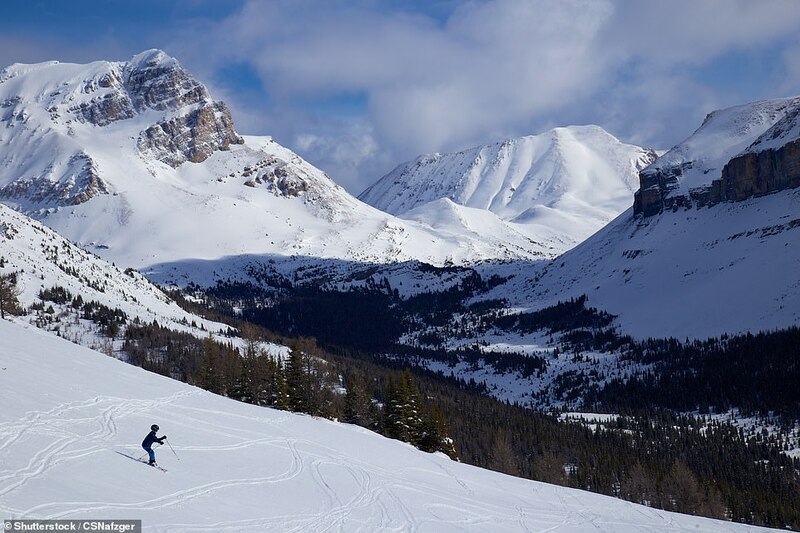 In fact, prices in all three Canadian resorts surveyed – Banff, Tremblant (£604) and Whistler (£828) – were lower than in the USA (Breckenridge: £832 and Heavenly: £845). Andrew Brown of Post Office Travel Money said: ‘There is no denying that Bulgaria is a great destination for cash-conscious skiers. Not only are prices in Bansko at least 10 per cent lower than in its closest competitors, but ski essentials cost less than half those in a third of the European resorts surveyed – including top ones in France, Austria and Switzerland. ‘Bansko is ideal for beginners but also offers challenging red runs for experienced skiers. ‘With growing pressure on the holiday purse, resort costs should be a key factor in deciding where to ski this season. Sterling is currently stronger against currencies for most European ski resorts compared with last year so it is local prices that will make all the difference. While Chris Logan, Crystal Ski Holidays managing director, added: ‘Bulgaria is known for being a great value destination for ski so it’s little wonder Bankso has taken the top spot this year, but it’s great to see so many other resorts in the mix for price conscious customers. ‘We’ve also got some new resorts featuring in the report for this year, including Rauris in Austria where we’ve featured offers such as free lift pass and equipment hire for children up to the age of 12, making it even better value for money for families.